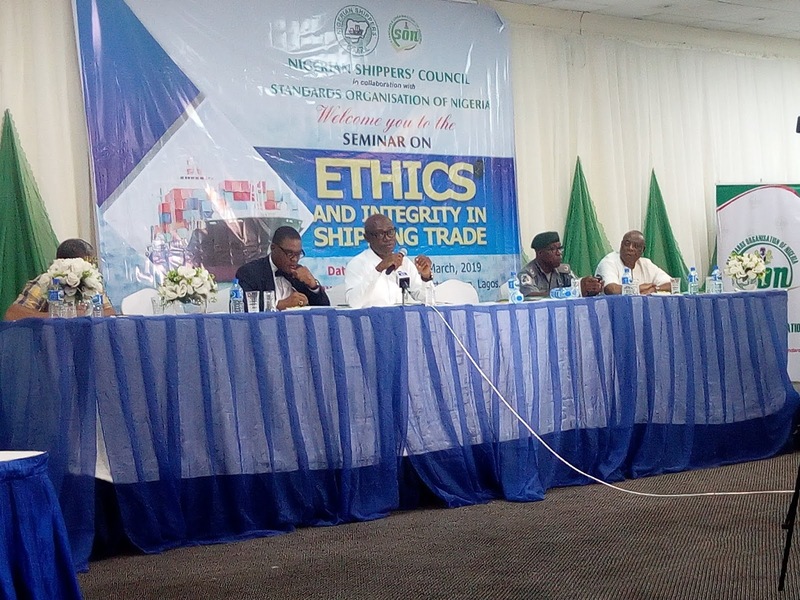 The Nigerian Shippers’ Council in collaboration with the Standards Organisation of Nigeria (SON) on Thursday urged the trading public including importers, customs licensed agents and other key stakeholders to ensure they carry on their business operations with integrity. Executive Secretary of the Nigerian Shippers’ Council, Barr. Hassan Bello, made the charge at a one-day sensitization seminar on components for trade facilitation with the theme “Ethics and Integrity In Shipping Trade” which held at the Golden Tulip Hotel, Lagos. The Shippers’ Council boss explained that the seminar aimed at promoting a new port order that would ensure transparency, reduce the cost of doing business and achieve a more efficient port system in the interest of trade. He said: “The Council’s goal is to promote an efficient port system that will encourage healthy competition, enthrone transparency, facilitate trade, reduce cost of doing business and make all players aware of their duties, obligations, responsibilities and liabilities. Delivering a paper titled ‘The Role of Nigerian Shippers Council in Trade Facilitation’ Bellow, who was represented by Chief Cajetan Agu, the Director Consumer Services of the Council, said the Council had continued to work toward trade facilitation. He said that the Council had been carrying out key actions including interventions of creating awareness, sensitizing stakeholders on the Standard Operating Procedure (SOP) in the port sector as well as conflict resolution. Bello noted that since trade facilitation aims at reducing the complexity and cost of trade transaction process, traders must also embrace transparency, as regulatory agencies work on simplifying the documentation processes, adopt technology for automation and reach mutually-beneficial agreements on movement of goods across the borders. Speaking on the legality of the Council to register all port service providers, Bello said the exercise was being done according to the provisions of the Act setting up the Nigerian Shippers’ Council as economic regulator. He said the Council is empowered to register all port service providers, in order that it guides against faceless importers and exporters who may want to engage in unwholesome practices. Representing the Director General of SON, Mr. Osita Aboloma, the Director in Charge of Inspection and Compliance in SON, Mr. Obiora Manafa, SON is positioned to ensure compliance with regulations and standards for goods. He said SON had been working proactively, sensitizing importers, to guide against sub-standard goods coming into Nigeria. Aboloma also said that to entrench the ease of doing business at the ports, SON has embraced digitization in order to reduce human interaction as much as possible. He, however, noted that as SON works to ensure traders’ compliance to prescribed standards of goods being imported, some importers have decided to work in line with the guidelines, while some others remain recalcitrant indulging in fake declaration and other vices. Also speaking, the customs officer in charge of the export desk at the Customs Command in Apapa Area 1, Deputy Controller Nelson Ochai, encouraged the importers and exporters to be transparent in their declarations. Ochai referred to a case of unwholesome trade practice when an exporter emptied a container of cashew after inspection and loaded the container with a helicopter. He said: “You can imagine such malpractice, when an exporter changed the content of a container from cashew to helicopter after the container had been examined and granted clearance. The interactive session however provided a platform for some stakeholders to express their displeasure over hectic processes they undergo with SON to bring in goods, even after meeting all prescribed requirement. They decried the multiple payments they make for the same service, just as they did over the collection of samples by SON for testing, adding that SON never returns samples collected. Responding to that, SON said samples collected like cylinders were always destroyed in the course of carrying out standards test. The stakeholders commended the initiative for such interactive session and said they looked forward to more of such, where they would be able to raise issues affecting trade facilitation with a hope to getting them addressed by the authority concerned.